Fiesta Inn has transformed the concept of Business Class hotels, and these innovations can be found everywhere at Fiesta Inn Aguascalientes Patio, with its transformed image and facilities. Designed to accommodate the modern business traveler, our spaces are functional and friendly and can be used for individual or group work so you can be productive in a comfortable environment. Fiesta Inn is more than just a hotel; it’s the place where you achieve your business trip goals. The hotel is located in the Patio Aguascalientes business district next to the Aguascalientes Theater and the Discovery Museum, 10 minutes away from the historical downtown district, and 25 minutes from the International Airport. Located near the automotive factories, our hotel offers the best location for visitors travelling for work in the automotive industry. Fiesta Inn offers 126 rooms, a fitness center, 24-hour room service, high-speed Internet access, dry cleaning services, a parking structure, and a 360 Lounge with the La Isla Restaurant, B-On, a self-service area, and a convenience store. We would like to remind you that check-in starts at 3pm and is subject to space availability. Check-out is at noon. We recommend that our guests use our express check-out service. Fiesta Inn Aguascalientes Patio presents La Isla, a place where you can enjoy what you like whenever you want it: a buffet breakfast, grab-go-food, and charging stations 24 hours a day. We offer a la carte menu service with a variety of delicious snacks and meals. We also have a healthy menu that includes salads, pastas, sandwiches, fish, and more. Enjoy what you crave in this modern, vibrant ambiance, or request room service from the comfort of your bed. 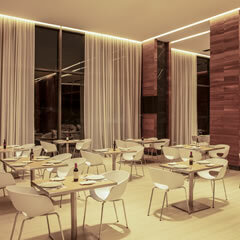 Work becomes a pleasure at B-On, an open and modern space located in the 360 Lounge. B-On offers computer workstations, office services, and high-speed wireless Internet access so you can be connected to the business world at all times. 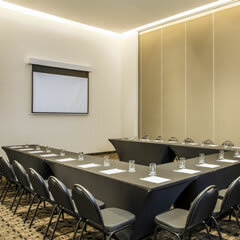 There are also three meeting rooms for video conferences, meetings, or presentations in real time. Enjoy a productive and relaxing stay in this comfortable room complete with everything you need to take care of business: a king bed, a desk with a chair, wireless Internet access, a phone, a coffeemaker, a closet, a full bathroom, air conditioning, and cable TV with an LCD screen. Everything you need to make your business trip successful can be found in the Superior Room. Work, relax, and sleep comfortably in this room complete with two queen beds, a desk with a chair and lamp, wireless Internet access, a phone, cable TV with an LCD screen, a closet, a coffeemaker, air conditioning, and a full bathroom with toiletries. Our suites are designed for you to relax, work comfortably, and enjoy the unique details of the room. This modern and large suite has a king bed, a desk, a closet, a phone, a coffeemaker, wireless high-speed Internet access, a full bathroom, air conditioning, and cable TV with an LCD screen. This suite also offers a living room with a kitchenette, a microwave oven, an alarm clock, a sofa bed, and excellent lighting. Enjoy your stay in this functional room with everything to attend to our guests with special needs: a bathroom with a ramp and a safety bar in the shower, an elevated toilet seat with handles, and a wide door. The room is also equipped with a twin bed, a work desk, a closet, a phone, a coffeemaker, wireless Internet access, air conditioning, and cable TV with an LCD screen.